Isn’t it nice when everything just works smoothly together? Connecting your team’s business tools with PageProof is simple and gives your team flexibility to create proofs from wherever and receive notifications whenever. Send out proofs and import to-dos directly into your Adobe CC apps. Set up single sign-on for logging into PageProof with ease, and controlling logins. Select files from Google Drive, Box, Dropbox, OneDrive, or your local computer. Create, then share from Canva. Quickly create content in Canva, then create a proof to send through a PageProof workflow. Flexibility to send proof notifications to popular tools like Asana, Trello, Google Docs and more. Single sign-on for seamless account login and management. This is all possible if your organization has a PageProof for Enterprise license and is using one of these SSO providers: Microsoft Azure Active Directory, Centrify, Okta, G Suite or OneLogin. Creating proofs and new versions from directly within your Adobe Creative Cloud application is easy once you’ve downloaded our free Adobe add-on. 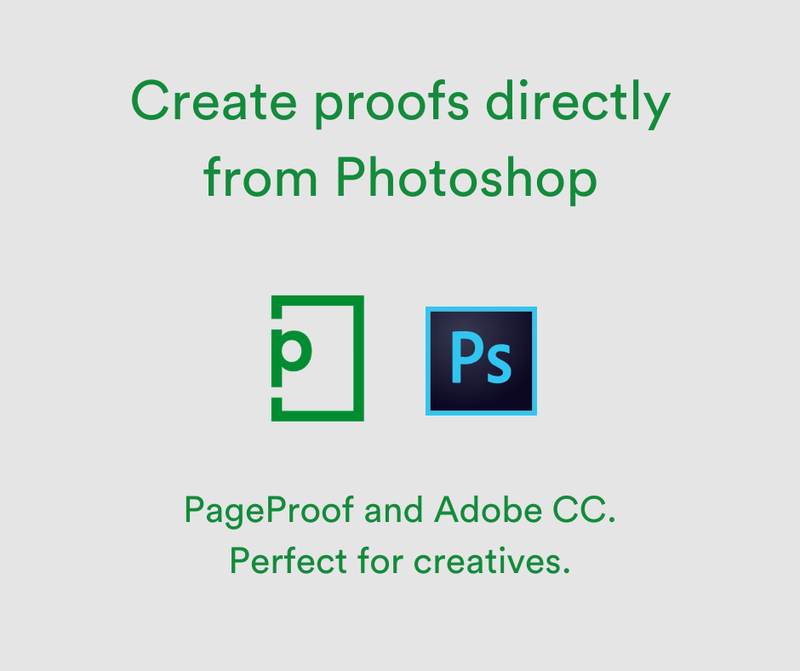 Create proofs of images directly from Adobe Photoshop by downloading the PageProof Adobe CC add-on. We show your reviewers a proof of the active layers of the Photoshop file. If you’ve allowed them to download the original file, they will receive the Photoshop file with the active layers. When you receive a to-do list of changes, you can display these to-dos layered clearly over your Photoshop file as notes. If your work is stored in the cloud using popular storage providers such as Dropbox, Box, Google Drive or One Drive, simply direct PageProof to grab your file from that location. Now you can create proofs whilst on the move with your mobile or tablet device! Also, there’s no need to download any apps for PageProof on mobile devices – all you need is a browser. Nice and simple. If you use Dropbox for file storage, you can choose to select your file that you wish to upload as a proof directly from this location. Simply authenticate your Dropbox account with PageProof after clicking the Dropbox icon on the file dropper. If your team use communications tools outside of email, why not send notifications there too! When proofs are approved, or have to-dos requested, a notification will instantly pop into your chosen integration letting your team get that quick overview they’re after of everyone’s work. If your team are using Slack for team messaging, why not streamline your workflow even more by getting proof approvals and proof to-do list notifications delivered directly into your team’s channel. PageProof and Canva. Perfect for creatives. Creating designs in Canva and sending them out for review and approval in PageProof is a match made in heaven. The PageProof Chrome and Firefox browser extension lets you choose a PageProof workflow when you decide to share your design creation. Create your own zaps to over 1000+ apps! With PageProof and Zapier you have all the flexibility your team needs to create your own integrations with popular tools like Asana, Trello, Google Docs and so many more. We have pre-built some zaps to get you started, but you can build your own zaps for a complete, customized integration experience.